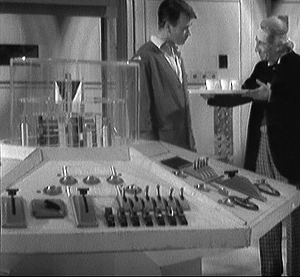 The first TARDIS console prop served three Doctors before being retired in 1970. The following is an account of the original prop and its modifications and refurbishments throughout the 1960s up to its final use in Jon Pertwee's first season. In the autumn of 1963 designer Peter Brachacki created an iconic control room for the TARDIS in Doctor Who. His vision of a room dominated by circles and repeating hexagons was realised by Shawcraft Models - an outside company contracted to supply special props for the series - and they also built the console at its centre which went before the cameras for the first time on September 27th 1963. In the first four-part story generally known as An Unearthly Child, the TARDIS interior featured heavily and the occupants didn't leave its confines until nearly eight minutes into episode two. At the end of the serial a Radiation Detector was seen in close-up on one panel but it would turn out to be a rarity that a featured component was built into the prop in advance. On future occasions, any direct reference to part of the TARDIS tended to result in something being added hastily added before recording. 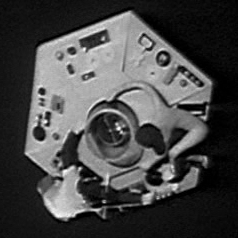 The third serial The Edge of Destruction went before the cameras on 17th January 1964 and it revealed that the ship was alive, telepathic and capable of controlling some of its own functions. A Fast Return switch was required to feature in close up and so a small new addition was made ahead of the second studio session on 24th January with the device being labelled in English, in felt-tip pen (pictured right). Various unremarkable sequences were taped throughout the first season with one of the few noteworthy comments coming when the Doctor informs Barbara that the scanner should work in colour but was stuck in black and white. The penultimate story of the first run was The Sensorites which contains another minor reference to one of the controls. 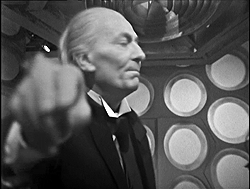 On this occasion, The Doctor taps the right-hand dome at the centre of a pair of spinning rings of lights, and explains that "this says everything has stopped but the ship." What the Doctor means is that the readout is confused because (for the first time in the show) the TARDIS has materialised inside another spaceship. After a rebuild of the console during the 70s, an identical-looking component would be revealed as the "telepathic circuits". Early in the life of the prop, two large black grilles were lost from one panel, giving it an extremely empty appearance. These items would never be replaced. The blank area can be seen pictured right. The final story of the season, The Reign of Terror, began recording on 10th July 1964 and in episode one the Doctor claims to have successfully piloted the ship back to Ian and Barbara's time to return them home. He had failed, however, and the regular cast resumed production for the Season Two opener Planet of Giants only a month later. In this story an unspecified component of the console over-heats, causing the TARDIS doors to open before the ship had properly materialised - an emergency situation resulting in the ship reducing in size. When the ship's scanner attempts to display the incompatible outside world, the screen explodes. This effect was achieved by showing footage of a shattering glass pane - an effect rather spoilt by the scan-lines of the TV remaining visible on the supposedly broken surface of the screen (pictured left). The ceaseless studio routine meant the TARDIS set always had to be flexible to the time and budget. When studio space was at a premium during recording of the first episode of The Chase on 30th April 1965, the console wasn't even present in a scene where it was supposed to feature, so William Hartnell merely mimed down the lens of the camera (pictured right) with limited success. 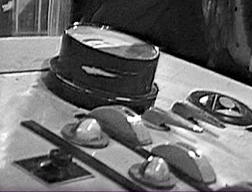 The console was however prepared for the third episode of The Chase, for which a new component was added during the second week of May 1965. 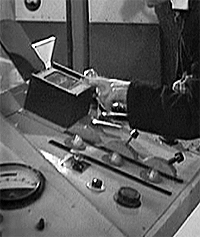 The Doctor explains that the console has a Time Path Detector (pictured left) which had not previously registered since he'd first built the ship. The new flashing indicator promptly disappears again in the following story, but this next adventure itself had some noteworthy elements. Immediately contradicting the Doctor's comments about the origin of the ship, the season finale The Time Meddler established that TARDISes were commonplace and another member of the Doctor's race - masquerading as a Monk - has one of his own. 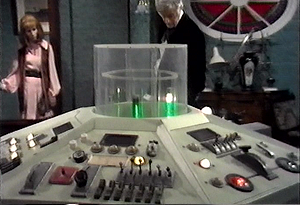 The noraml TARDIS set was used with the console on a raised dais. Patrick Troughton became the Second Doctor in 1966 and inherited a TARDIS which was essentially unchanged from the latter days of the William Hartnell era. 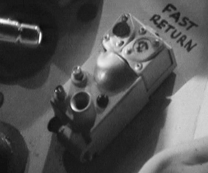 Lengthy scenes inside the time machine were appearing less and less, and following Troughton's debut story, only The Underwater Menace and The Moonbase made any use of the TARDIS set during Season Four and aside from a brief filmed insert at the beginning of Tomb of the Cybermen, the control room wasn't used properly until taping the opening episode of The Abominable Snowmen on 15th September 1967. The console never had any significant repairs done up to this point but some small changes did take place. Where originally one panel had had two L-shaped levers in the bottom corner (pictured right), these were lost and became replaced by one small button and one large one (see below). At the start of The Web of Fear a light flashes to indicate the TARDIS had landed, whilst they were clearly still travelling in space. This echoed the conversation in The Sensorites about whether the ship had stopped moving. The flashing bulb was a new addition for the story and was set in place during refurbishment in December 1967. 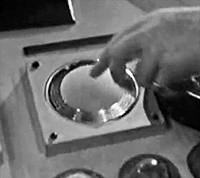 The late Troughton period saw a significant amount of damage sustained to the prop and in these scenes it can also be noted that the lever part of at least one toggle switch had been lost, whilst others including the main dematerialisation switch were missing their ends. Inside the central column, a section of the lighting mechanism had to be secured with tape. The picture (right) shows a row of switches in which only two have their original spherical tops (all present a year earlier), and tape has been wrapped around a couple. In the season's final story, The Wheel in Space, a number of interesting features of the TARDIS were revealed. Firstly the ship shows the Doctor and Jamie images of pleasant places to try to warn them away from where they've landed. After a technological problem (something increasingly common at the time) the occupants were forced outside by vapourising mercury but not before the Doctor disengages the Time Vector Generator so that the inside becomes an ordinary telephone box. The solution to this extraordinary situation was never shown, with the Doctor just casually appearing inside the control room in episode six, with no explanation how he might have restored the inside of the ship without being able to access the console! One modification was performed for recording this material, whereby a large black box was mounted on one panel, which is part of the aparatus which breaks down at the start of the story. This addition was made in time for studio work on 5th April 1968. In the bottom left corner of this panel are the two buttons (pictured left) which replaced the lost L-shaped levers mentioned earlier. Production difficulties in Patrick Troughton's final season resulted in The Mind Robber requiring an episode to be hastily added which was set inside the TARDIS. Studio recording took place on 21st June and the haste with which the script was written shows in the fact that a whole sequence of events is repeated from just two stories earlier. Once again the TARDIS overheats, the mercury-filled fluid links start to vapourize, and the crew are nearly overcome with fumes. Just as in The Wheel in Space, an ungainly new component is added to the console to play a part in this sequence and the gigantic power meter from which Zoe reads (pictured left) is positioned in exactly the same place as the large black box had been. What's perhaps most strange about the appearance of this dial is that it had been relocated from another part of the console. Two panels over, next to the radation detector, there were usually two large meters, but in The Mind Robber, the right-hand one had been removed and a face-plate had been positioned to cover the hole (picture right). 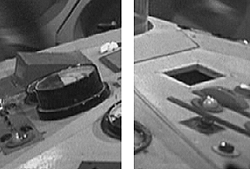 For this episode, the Doctor also reveals an Emergency Unit is hidden in a compartment under the console and when slotted into the panel above it removes the TARDIS from the time/space continuum. This device (pictured left) was fitted to the opposite side of the panel which contains the Fast Return switch. Next to the Emergency Unit, one of the bubble lights had been lost from the console, leaving a hole. 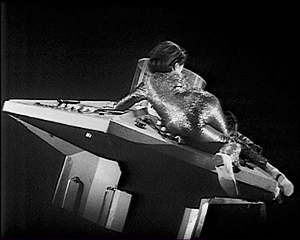 The unusual episode ends with an infamous shot of Jamie and Zoe riding the TARDIS console through a black void. 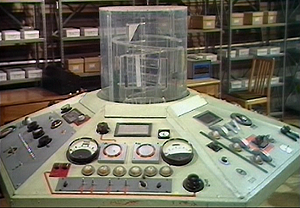 Shot on film at Ealing a month earlier, the console prop is shown before many of the above modifications have taken place, and it is likely that some of the damage seen in this episode was caused by the companions climbing on top of the panels (right). The final shot of the console spinning off into the blackness was achieved using a model of the prop and two figures (pictured left) which was constructed in the first week of June. It is notable for the fact that the panels on on this little model bear no relation to the full-sized article. The repositioned power meter mentioned above was later returned to its correct position, although it was not refitted correctly. It protrudes more than twice as far out of the surface of the console as the left-hand dial and the panel where it was temporarily mounted was left with a large rectangular hole. The replaced dial and resultant hole are shown respectively in the right-hand image. By the time Patrick Troughton's final story came to be recorded on June 12th 1969, the console was in considerable disrepair. 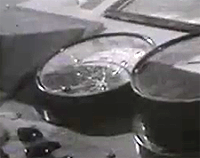 Studio sessions for The War Games clearly showed that amongst other things, one of the black and white squares was broken and lost from inside the central column (pictured right), and next to the repositioned power meter, the glass front of the other dial had been smashed (pictured left). This was the last time that the prop and indeed the programme itself would be seen in black and white. Jon Pertwee took the reigns in 1969 and his first story was broadcast in January 1970. No TARDIS scenes were required for his debut adventure and at the end of that story it was firmly established that his adventures for the foreseeable future would be set on Earth. 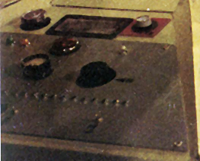 Two stories later in Ambassadors of Death, a scene featuring the TARDIS console was required and the old faithful prop was brought from storage for studio recording in February 1970. For its appearance with the new Doctor a handful of replacement knobs and buttons were added where bits had dropped off, (some of which can be seen in the picture on the left). In all major respects the console remained the same. What is unique about the first appearance of the prop in colour is that it has been removed from the TARDIS and is residing in a room presumably at a UNIT facility. The console had already been seen to move and spin (in The Web Planet) showing it was not firmly fixed to the floor (and the first Doctor's comments about the heart of the ship being beneath the column could still be true if we assume the power source lies within the base of the console) but to be able to remove the console from the ship still seems surprising to say the least. One interesting comment during this surreal business is that the Doctor says he's trying to re-activate the TARDIS's Time Vector Generator. Two seasons previously in The Wheel in Space, the Doctor said that de-activation of this component causes the interior of the ship to simply become a Police Box again. Whilst it doesn't fully explain what's going on, it does perhaps hint that if the ship is no longer bigger on the inside, it might "eject" the console into the real world until a repair can be carried out. The Doctor also says that the Time Vector Generator could send a person into the future once working. When the console was used again in the following story Inferno, it would be the last ever appearance of the seven-year-old prop and although further damage had been caused inside the central column, the rest of the prop had undergone a considerable overhaul in time for filming work at Ealing on 6th April 1970. A couple of weeks later the revamped prop was brought to the studio for recording episode one on 23rd April. All over the prop, new devices had been added to make the surface look more busy. The panel from which two grilles had dropped off in the early 60s had a new red and black control added. The panel that sported two spinning lights had a few additions too. In the area once briefly occupied by the Time Path Detector, a large black tuning dial was added and on the other side, a small gauge. Beneath the large power meter on the left a section of circuit board had been added (pictured above left). One particular element of the refurbishment would have significance in the future: Various sections were now adorned with red strips as connecting pathways, many of which ran between the recently-added components. These geometric routes between buttons and dials were influenced by the idea of a printed circuit board and they were added all around the prop (pictured above and right). They also injected some additional colour into a prop which had been designed for the black and white era. The most significant change to the structure of the prop was the replacement of nearly an entire panel. The area of the console which had once carried the Radiaton Detector and the two large, round Power Meters (one of which had been briefly moved during The Mind Robber) had gone, and in their place was a large metal plate carrying new knobs and a row of switches. Like the red circuit pathways, this large metal plate would also have a relevance in future when it came to the building of a brand new prop. And so, with the ageing original having been retired in 1970 it was decided that the following year, Jon Pertwee would get a brand new console prop all of his own.